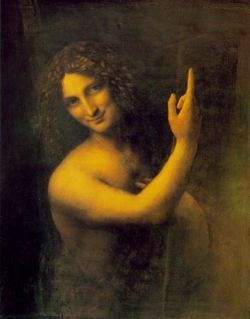 John the Baptist (Hebrew:יוחנן Yochanon "The LORD is Merciful") was born approximately six months before Jesus Christ and holds the distinction of being the man chosen to baptize Him. He was of priestly descent through both parents: his father, Zacharias, was a priest of the line of Abia and his mother, Elisabeth, was descended from Aaron. Zacharias had been granted the privilege of offering incense in the sanctuary, and it was as he stood before the altar that the angel Gabriel appeared and announced to him that he would have a son, who was to be called John. This son, the angel told him, would be a lifetime nazirite and "16...many of the children of Israel shall he turn to the Lord their God 17 And he shall go before him in the spirit and power of Elias, to turn the hearts of the fathers to the children, and the disobedient to the wisdom of the just; to make ready a people prepared for the Lord" (Luke 1:16-17). When Zacharias expressed doubts, due to his and his wife's advanced age, the angel struck him dumb "until the day that these things shall be performed, because thou believest not my words, which shall be fulfilled in their season" (Luke 1:20). When Zacharias came out of the temple and was unable to speak with the people waiting outside, they realized he had seen a vision; speechless, he communicated afterwards with signs. When his period of temple service was complete, he returned home, and soon after Elisabeth conceived. When Elisabeth was six months pregnant she was visited by her relative Mary, who was then pregnant with the Holy Spirit; as soon as she heard her relative's greeting, Elisabeth's unborn child leaped in her womb, and she acknowledged the child to be born to Mary as her "Lord". On the eighth day after John's birth, at his circumcision, neighbours and relatives wanted to name the child after his father, but Elisabeth refused, and Zacharias, who could still not speak, wrote down that he was to be named John. As soon as he had done this, as Gabriel had said, his power of speech returned. According to Luke, John began his ministry in the fifteenth year of the reign of Tiberius Caesar; John would then be about thirty years old. Though there is no record that John engaged in priestly service at the temple, this would have been the age for priests to commence full duties; his status as a lifetime nazirite would have probably overridden this. And thou, child, shalt be called the prophet of the Highest, for thou shalt go before the face of the Lord to prepare His ways. John ate locusts and wild honey and baptized at the Jordan River with the Baptism of Repentance. He was very popular with the Jewish people who considered him a prophet and is mentioned in sources outside of the Bible. Many came to be baptized by him. He baptized Jesus "in order to fulfill all righteousness". John spoke out against the Pharisees and against King Herod marrying his brother Phillip's wife, Herodias. Because of this Herod had John imprisoned. According to Josephus, John was kept in Machaerus east of the Dead Sea. Eventually John was executed by King Herod, although not by Herod's wishes. Herod was throwing a banquet and the daughter of his wife, named Salome was performing her dance of the seven veils which was meant to appeal to sensual desires. Herod was so overcome with her presentation that he publicly proclaimed she could have anything she wanted, up to half his kingdom. (The saying was not meant to be taken literally as being able to claim half his kingdom, but was understood in the ancient Mideast as making a vow to honor any one request). Salome went to her mother to find what to ask, and Herodias had her publicly ask for the head of John the Baptist. Herod didn't want to have John killed, but had no choice to save face in front of his dinner guests, and so John's head was brought on a platter and Salome then presented it to her mom. Herod was so spooked by what he had done that when Jesus started performing public miracles, Herod felt it was John who had come back from the dead. Members of the Church of Jesus Christ of Latter-day Saints (Mormons) believe that on May 15, 1829 A.D., the resurrected John the Baptist appeared to Joseph Smith, Jr., the founder of the Mormon religion, and Oliver Cowdery, who would become the second elder, and conferred upon them the Aaronic Priesthood, which included the authority to baptize. ↑ Tiberius began his rule as Roman emperor on August 19, 14 AD; his fifteenth year would run from August 19, 28 AD to August 18, 29 AD. Since Jesus Christ (also about aged thirty) presented Himself for baptism in the autumn, John at six months older must have commenced his ministry in the spring of 29 AD. This page was last modified on 20 February 2018, at 23:04.